And in that long and burning kiss thy happy spirit pass'd. And live, beloved, when I was gone, for many a happy day. And thou wast with the sainted, where the weary are at rest. Since thou are where the ills of life can never reach thee more." 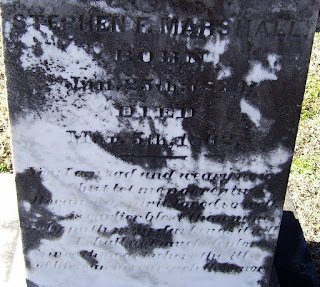 The last four lines of the beautiful poem above, written by J. Peabody, were used as an epitaph on the stone placed for Stephen F. Marshall (25 Jan 1839 - 5 Mar 1862) in Waverly Hall Cemetery at Harris County, Georgia. This is a good example of why I like learning, if possible, what epitaphs mean or where they come from. After reading the entire poem, I knew beyond a doubt the love Stephen's family had for him and how much he was missed.